After making the map posted here I realized that its patterns are so odd that it would make an extremely difficult GeoQuiz. Just one question: what does the map show? The topic being mapped is commonplace, familiar to all readers. The categories are relatively precise, with almost no overlap or gradations, and they derive from an authoritative website devoted to the topic under consideration. A few countries, however, do not fit easily into any of the categories used. I have thus put question marks on two of the most problematic countries, Ethiopia and the United Kingdom. The groupings on the map are oddly patterned. What might link Japan, Guinea, and the Central African Republic? Why would Bangladesh and Fiji be in a category of their own? Only a few of the categories fit within traditional world regions. The yellow countries are all in the greater Middle East, and the light blue aggregation is found only in the Caribbean. Medium green is mostly confined to Latin America, and light brown is concentrated in northern and southeastern Europe—but includes Kenya as well. A few size correlations are evident. 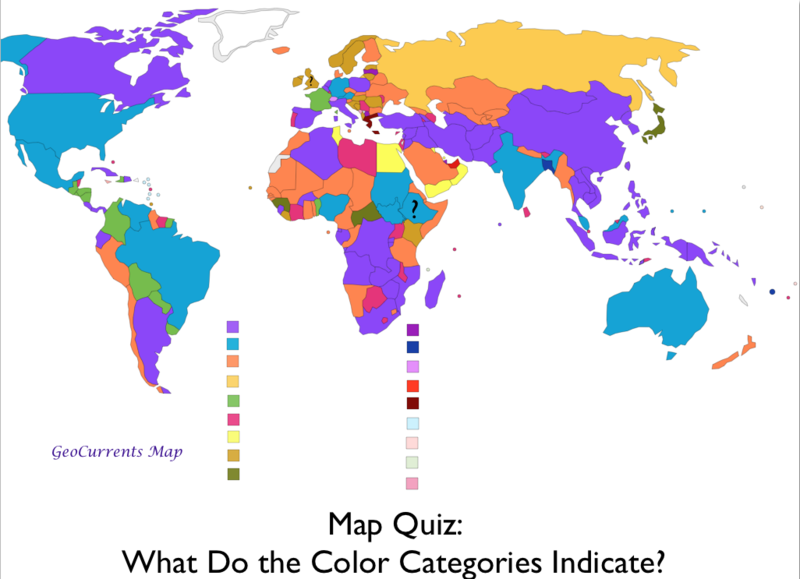 The mid blue category covers a group of large countries, while the light blue grouping includes only small ones. A number of countries occupy categories of their own: Russia, Greece, Montenegro, the United Arab Emirates, Switzerland, and the Comoros. 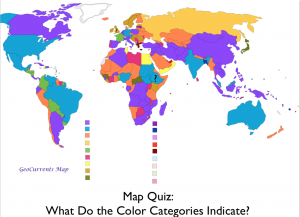 On the GeoCurrents map, non-sovereign states, such as Greenland, Puerto Rico, New Caledonia, and the Palestinian territories, are unmarked, and the Western Sahara, mostly occupied by Morocco, is left in the same neutral gray. On the website that provides the source material, however, these areas are classified as well, as are many other dependencies. No information is available on that website, however, for Kosovo. The actual map, with an explanatory title and full key, will be posted tomorrow — or earlier than that if someone figures it out.